HERO's mission is to provide quality recreation for all people with disabilities. HERO, INC. was incorporated as a not-for-profit company in 1992. HERO's mission is to provide quality recreation for all people with disabilities. HERO serves adults, adolescents, youth and tots living with mental retardation, autism, multiple sclerosis, cerebral palsy, traumatic brain injury, visual and hearing impairments and those termed "at risk." HERO provides scholarships for disadvantaged adults and children. Everyone can participate! 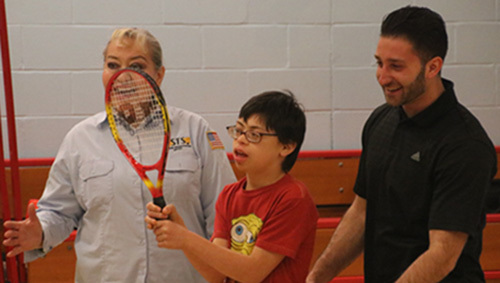 Since 1992, HERO has served over 17,000 adults and children through adapted tennis carnivals and on-going programs from 6 weeks to year-round. HERO has also run adapted karate and yoga and currently, besides tennis, provides dance, movement/song and PUP (Pups Uplifting People). Its latest addition is arts and crafts. HERO is always looking for new ways to serve its special clients, to provide them with unique experiences that enrich their lives.